DUMBARTON and visitors Cowdenbeath, in 9th and 8th places respectively in the Irn-Bru Scottish League, shared the spoils in a bruising encounter at the Bet Butler Stadium. DUMBARTON and visitors Cowdenbeath, in 9th and 8th places respectively in the Irn-Bru Scottish League, shared the spoils in a bruising encounter on a mostly sunny afternoon at the Bet Butler Stadium in front of a 740-strong crowd. It was probably a fair result, but the home side blew the chance of three points by conceding a goal in the final minute for the second week running. Colin Cameron's Blue Brazil took command from the start and dominated the first half. A defensive slip let in Jamie Stevenson who scored the equaliser, a carbon copy of the first Raith Rovers goal the previous week. 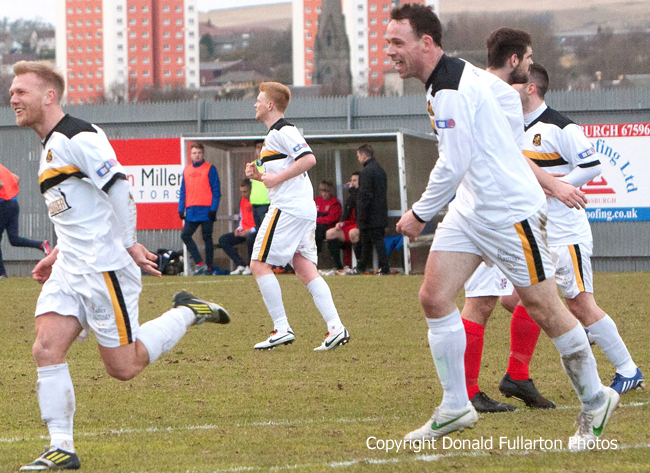 After the break it was a different story — Dumbarton were fired up and had the better of most of the half. The equalising goal came when a cross from man of the match Mark Gilhaney fell to Jim Lister. His effort was blocked, but Bryan Prunty followed up to net his 13th goal of the season. Six minutes before the end Paul McGinn sent over a cross which was met by Scott Agnew, and he netted from an acute angle. The visitors fought back, and on loan Motherwell striker Craig Moore netted in the 90th minute, moments after Gilhaney had claimed a penalty when he was tripped in the box. The picture shows a happy Scott Agnew after his goal.